Learn about the many uses of a rain barrel and how to build one. I just finished a book called “The Origin Diet” by Elizabeth Somer that seemed to make some valid points. She claims that by eating like our stone-age forefathers did, we could live longer, healthier lives. What does this have to do with being green? Two words – “Processed Foods”. The idea of a “green” society is compelling, but easier said than done. We are all so accustomed to the horn of plenty that we have been living in for the past 40 years that it’s hard to accept that ours is a lifestyle that is increasingly unacceptable to the rest of the world. I love taking little trips to different parts of Virginia to find different species of wildlife. But in Chesapeake you really don’t even need to leave home to find interesting things. I have lived in a pretty typical suburban neighborhood in Chesapeake for almost eight years, and during that time I’ve seen 96 different species of birds in my yard, and 53 different species of butterflies, including this Tiger Swallowtail (Virginia’s state insect). Not bad! 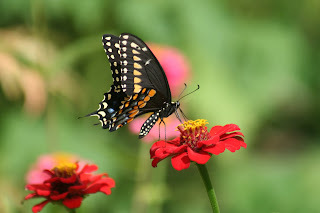 I also “raise and release” different kinds of butterflies right in my yard; this has become a popular past-time among many butterfly enthusiasts. Since 2005, I have raised and released a total of 2954 butterflies of 19 different species; I counted the totals today just for this blog. (Hey, I’m a librarian and I keep records of everything!) I raise these butterflies from caterpillars I find on the plants in my yard. I collect the caterpillars, place them in a screen cage, and feed them until they go into their chrysalis stage. After a couple of weeks in chrysalis, a new butterfly emerges. 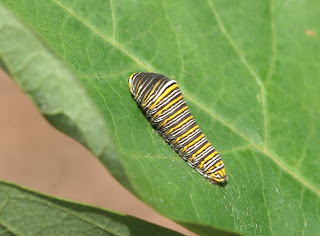 It’s not just by chance that the different kinds of caterpillars I collect find their way to my yard; I started the process by planting the appropriate native plants that attract the butterflies that lay the eggs. 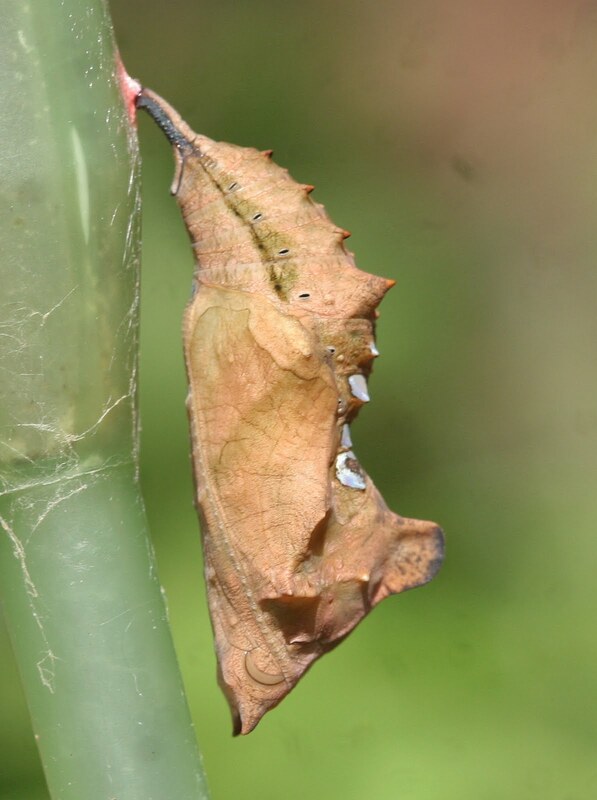 Each different species of butterfly lays its eggs only on a certain type of plant (called the “host plant”), because the caterpillars that hatch from the eggs can only survive by eating that particular plant. One of the host plants for the Question Mark butterfly is the hops vine, so I planted one for the purpose of attracting them to my yard. The trick to getting butterflies in your garden, then, is two-fold: First, you want flowering “nectar” plants for adult butterflies to feed on, which most people know about (If you can only have only one flowering shrub in your yard, make it either a Butterfly Bush or Lantana; you will be amply rewarded with butterflies). 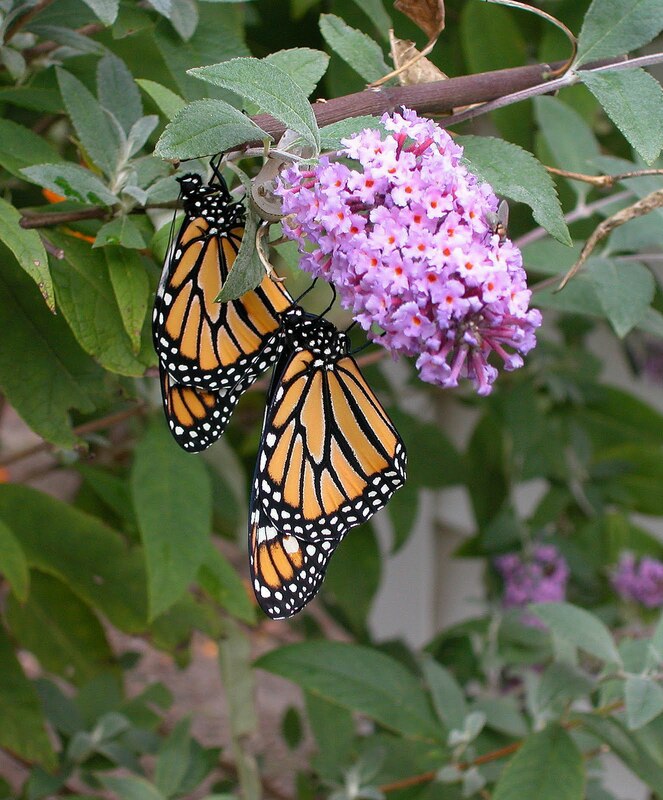 Second, you want the butterfly’s’ host plants if you want them to lay eggs and produce caterpillars. How do you know what the host plants are for different species? 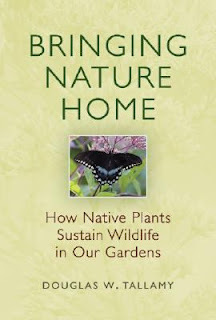 The two best sources I know are 1) a list of Tidewater butterflies and their host plants published on the Butterfly Society of Virginia’s website (http://www.butterflysocietyofva.org/ ; take the link to “Host Plants in VA”), and 2) a wonderful book by Doug Tallamy called “Bringing Nature Home: How Native Plants Sustain Wildlife In Our Gardens.” This highly readable and surprisingly entertaining book is full of information about the kinds of plants that attract different kinds of wildlife including butterflies. I highly recommend it. 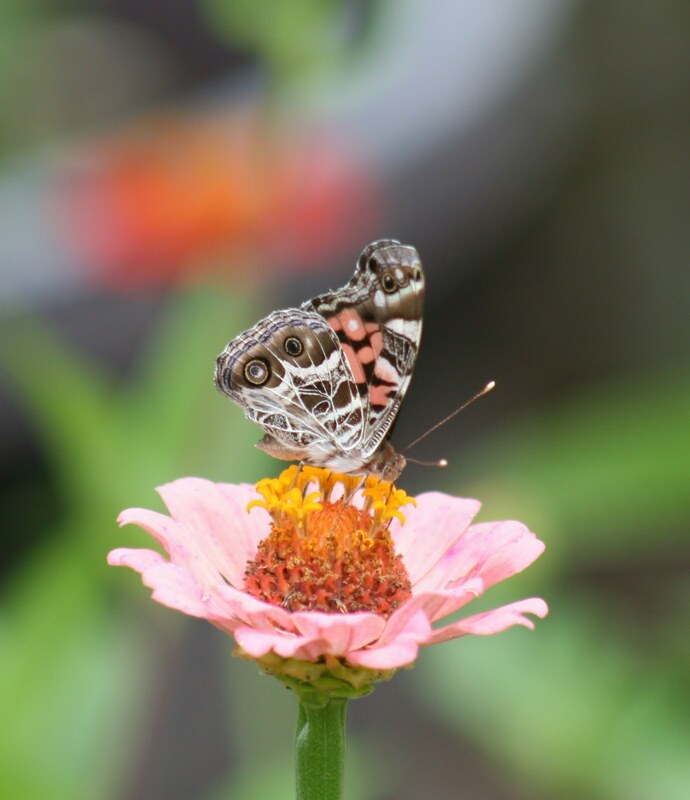 A symbiotic relationship has evolved over countless millennium between wildlife and plant life, so it’s not surprising to learn that most of the butterfly host plants are plants that are native to their particular region. 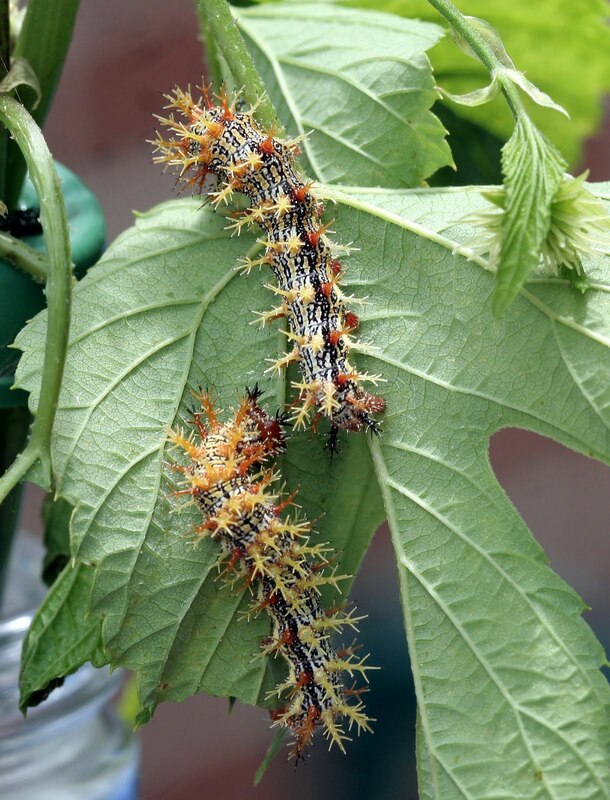 If you plant a plant that comes to us from China, our adult butterflies might drink nectar from its flowers, but our caterpillars will not be able to survive on its foliage and the species will not reproduce. In my garden I have a mix of flowering plant for nectar, and native host plants for the caterpillars; I’ve planted a Pawpaw tree which is the host plant for the Zebra Swallowtail, two Spicebushes for the Spicebush Swallowtail, milkweed for Monarchs, passion vine for fritillaries, fennel and rue for Black Swallowtails, Wild Cherry trees for Tiger Swallowtails and Red-spotted Purple butterflies, a Hackberry tree for American Snout, and many more. Most nurseries do not carry a wide variety of native plant stock, but you can purchase most of the plants you need at plant sales hosted by the local Master Gardeners organizations (http://www.vmga.net/), the Butterfly Society of Virginia (http://www.butterflysocietyofva.org/) , and the Virginia Native Plant Society (http://www.vnps.org/). I have also had success ordering native plants online through nurseries that specialize in natives. The Spicebush Swallowtail caterpillar you see here (above) uses “fright” as a defense. 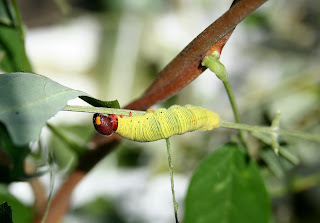 The “eyes” that you see are supposed to make the caterpillar look like a snake and scare away potential predators. The “eyes” are not eyes at all; they are clever pigmentation on the skin, including the white “sparkles” in the black “pupils.” This strange-looking little thing turns into the gorgeous butterfly you see on the right. 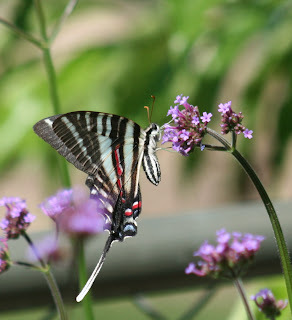 The spectacular Zebra Swallowtail uses only leaves of the Pawpaw tree as its host plant. 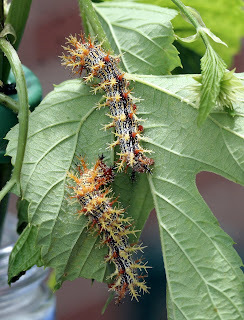 This is the first year I finally found some of its caterpillars (above) on my Pawpaw tree, and I’m thrilled to have raised and released ten of them so far. 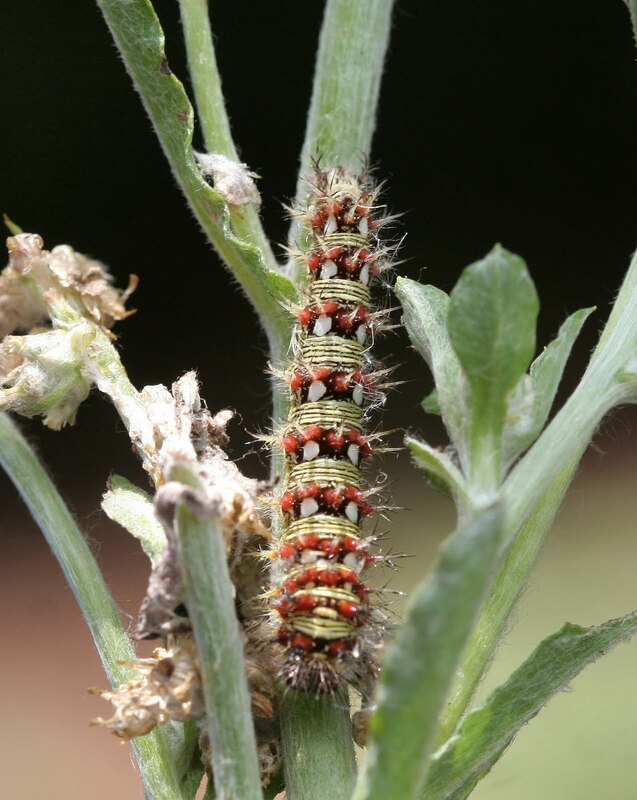 The alien-looking creature below is the larva (caterpillar) of the Silver-spotted Skipper. Be sure to look at this one in an enlarged version (just click on the picture to do this), because it is a strange-looking little guy. These skippers eat Wisteria leaves — but not the invasive, non-native Wisteria that you see everywhere in April and May. 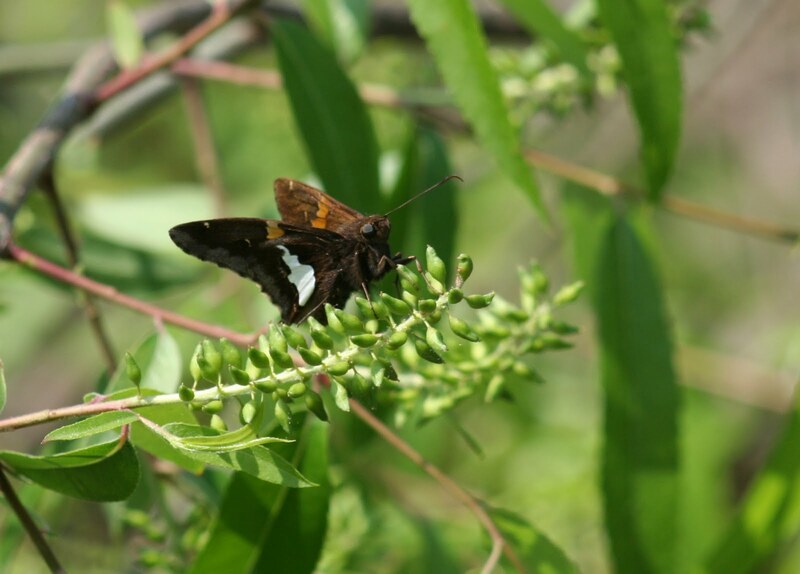 We have a Wisteria that is less aggressive, and is native to Virginia, and this is the type this skipper needs. Below is an American Lady caterpillar on its host plant, Pearly Everlasting (it also uses Cudweed and Hollyhocks as a host plant). The adult (right) is a very common butterfly in Tidewater, but it has a rare beauty if you look closely. 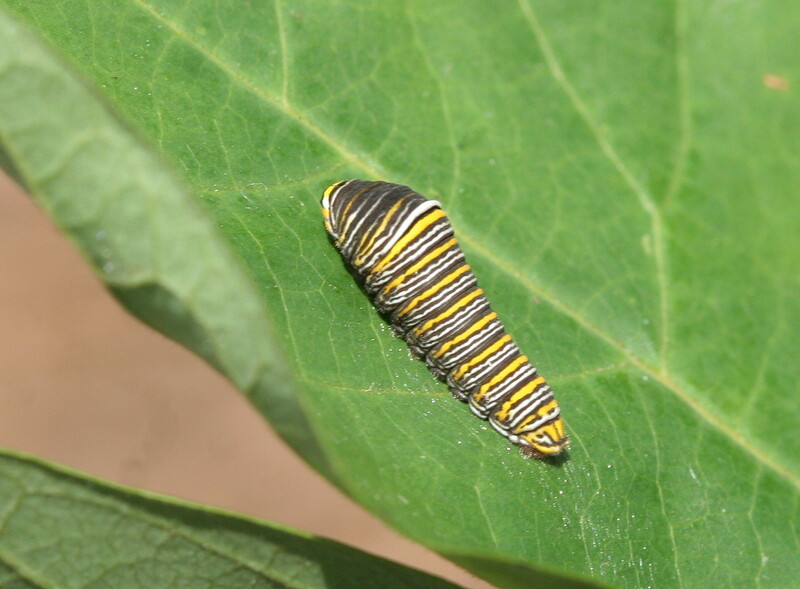 The two caterpillars most commonly and easily raised by people in the Chesapeake area are Monarchs (host plant is Milkweed) and Eastern Black Swallowtails, which use plants in the carrot family as their host (these include fennel, parsley, Queen Anne’s Lace, dill, and rue). Of all the butterflies I’ve raise d and released, almost 2000 of them have been of these two species. 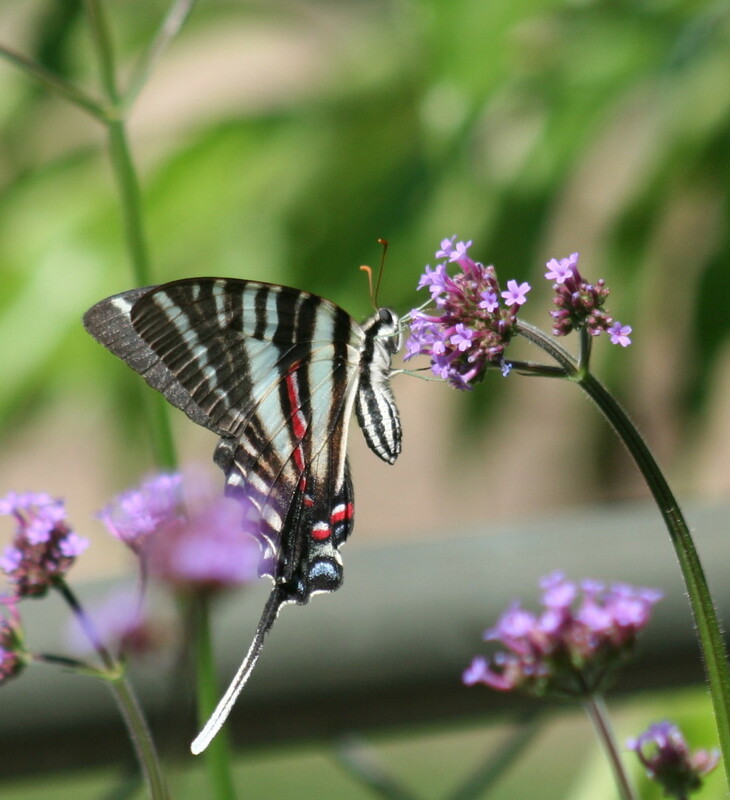 If you’re interested in learning how to raise and release butterflies, these are the species you should start with; plant some parsley or fennel and the Black Swallowtails (above) will find you. Just remember to plant enough to feed these little eating machines for a couple of weeks. These are just a few of the gems from my garden. Some people wonder why one would bother to raise the caterpillars themselves rather than just let Mother Nature take her natural course. 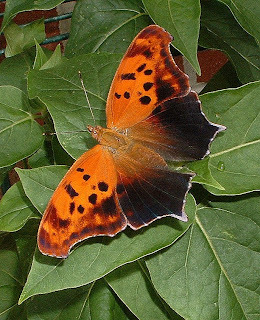 The benefit to the butterflies is that they have a far greater chance of surviving to adulthood; in the natural world most do not survive due to predation and parasites. Are we upsetting the global balance by releasing more butterflies than nature intended? I believe the answer is no; the numbers we release into the world are less than a drop in the ocean. But we do have a few more butterflies in our gardens than we did before, and we have the joy and satisfaction of witnessing nature’s miracles first-hand. If you are interested in trying your hand at this rewarding and fulfilling process, feel free to send your questions to me. I have a lot more information and suggestions that I can share with you that will help you get started and ensure the success of your butterfly-rearing. It was a book put out by the U.S. Department of Agriculture called “Living on a Few Acres” that started it all. Having grown up in the “urban” area of downtown Norfolk, my husband had always longed to live on a farm. He was a gritty Vietnam vet.